After World War II, the government of the City of Jacksonville began to increase spending to fund new building projects in the boom that occurred after the war. Mayor W. Haydon Burns oversaw the construction of a new city hall, civic auditorium, public library and other projects that created a dynamic sense of civic pride. However, the development of suburbs and a subsequent wave of “white flight” left Jacksonville with a much poorer population than before. Much of the city’s tax base dissipated, leading to problems with funding education, sanitation, and traffic control within the city limits. In addition, residents in unincorporated suburbs had difficulty obtaining municipal services such as sewage and building code enforcement. In 1958, a study recommended that the City of Jacksonville begin annexing outlying communities in order to create the needed tax base to improve services throughout the county. Voters outside the city limits rejected annexation plans in six referendums between 1960 and 1965. In the mid 1960s, corruption scandals began to arise among many of the city’s officials, who were mainly elected through the traditional good ol’ boy network. After a grand jury was convened to investigate, nearly a dozen city officials were indicted, and others were forced to resign. Population was on the decline. Economic growth had stalled. Property taxes were skyrocketing. “Consolidation,” that is, the consolidation of the Jacksonville city government and the Duval County government, gained momentum during this period. It gained support from both inner city blacks (who wanted more involvement in government) and whites in the suburbs (who wanted more services and more control over the central city). The simultaneous disaccredation of all fifteen of Duval County’s public high schools in 1964 added momentum to the proposals for government reform. Lower taxes, increased economic development, unification of the community, better public spending and effective administration by a more central authority were all cited as reasons for a new consolidated government. By state legislative action, the Local Government Study Commission was created October 1, 1965 with a report due to the “members of the Florida legislature from Duval County on or before March 1, 1967.” The Commission was comprised of a group of 50 nonpoliticians who were tasked with designing a better local government, and it was this group that guided the city through formation of a new government. “Not a cloud marred the sky as August 8  dawned on Jacksonville and Duval County. It was a lovely day – the kind of day that makes people want to get out and do things. A lot of them did. More than 86,000 Duval Countians went to the polls and voted. They voted overwhelmingly in favor of consolidation…Of 86,079 votes cast, 54,493 were for consolidation, 29,768 against. It was almost a two to one victory…” from the book, A Quiet Revolution. A consolidation referendum was held in 1967, and voters overwhelmingly voted for a centralized government as a way to cut duplication, increase efficiency and restore confidence. On October 1, 1968, the governments merged to create the consolidated City of Jacksonville. The day was highlighted by a parade and fireworks that attracted 200,000 people. The new city limits covered an area of 841 square miles, 20 times its former size. 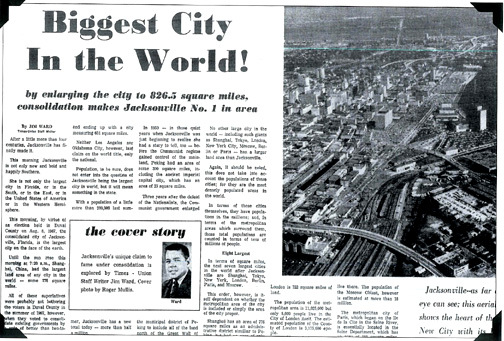 Overnight Jacksonville became the largest city in land area in the entire world. The city held the record for many years until sparsely populated Juneau, Alaska, annexed itself in to the record book. Jacksonville’s consolidation with Duval County in 1968 ended much duplication of urban services and provided political access for minorities. It also kept middle-income residents as taxpayers and voters, while attracting national corporations to relocate, providing jobs and tax revenues. 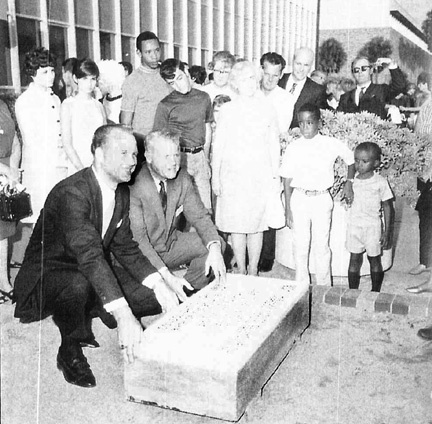 On that October 1, 1968 Consolidation Day, a time capsule was buried underground on the river “side” of the 1960 City Hall by Mayor Hans Tanzler and J.J. Daniel, chairman of the Local Government Study Commission. The etched stone cover mandated the capsule be opened October 1, 2000. The Jacksonville Historical Society participated the October 2000 unearthing and received the capsule and contents. The society houses the nearly unrecognizable contents and maintains an inventory of the items that were clearly soaking wet for most of their 32 years underground. Interestingly, the one item still identifiable, although highly altered, is the white hat of the tireless supporters of that quiet revolution. The “white” hat is on display at the society’s headquarters. The Jacksonville Historical Society’s cable television show, “The Jacksonville History Show” on Comcast Channel 29 also featured the story of Consolidation on its September/October program. The show featured a fascinating conversation with two men who played a key role in creating the government: James C. Rinaman Jr., who was a member of the Local Government Study Commission, the body that designed the new government; and Jack Chambers, who served as counsel for the Local Government Study Commission. Parts One and Two of the episode may be viewed below.